We conduct a thorough external inspection of the property to identify any potential defects such as rainwater systems, drainage and other maintenance issues, this is followed by an internal inspection of the walls of the property. By using electronic moisture measuring equipment we can obtain accurate readings as to the extent of the problem. Our surveyors have access to all the latest diagnostic and inspection equipment that is needed for accurate diagnosis. 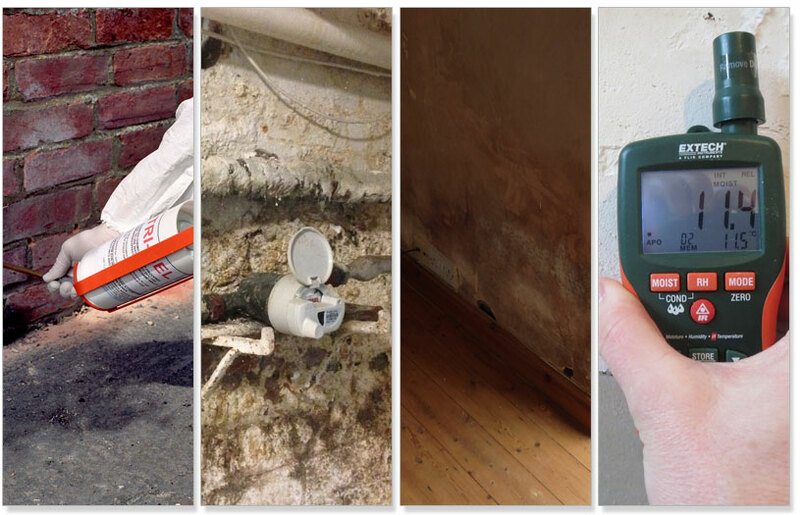 We can even examine hidden cavities, which can help us identify, among other things, bridged damp proof courses. Our reports contain comprehensive advice on any problems we have identified during our survey. The report includes our recommendations, the severity of the problem, the specifications and costs for repairs, if any repairs are necessary. We use many different repair methods and treatments for resolving damp issues ranging from water repellent sprays to physical membranes and diffusing gels. Our surveyors will specify the safest and most effective method of treatment for your circumstances. Our Surveyors recommendations for the repairs will ensure that they will be planned in such a way to cause the least amount of disruption to your everyday life.